Super Million Hair: Get Rid Of Balding and Thinning Spots in Just 30 Seconds! Hair loss is a very common condition, which anyone can face. However, most of us are scared of hair fall for fear of going bald. There are a few common myths around hair fall that lead people to follow various methods to prevent balding. Chronic illness, medicines, erratic lifestyle, improper nutrition & stress further adds to the baldness. Hair thinning or baldness is a very common issue among males, but these days’ even women and the youth too deals with these embarrassing hair issues. Recently I was introduced to a brand called “Super Million Hair” from RUAN, Japan. Super Million Hair is World’s No 1 Hair Thickener & Concealer – that are sold in more than 70 countries worldwide since 1986. This hair building fiber is ideal for both men and women who face hair thinning or bald patches. It is now being imported and marketed by NK Healthcare Pvt. Ltd and is sold in India. These Building Fibres help to restore your hair & give you that extra confidence in 30 seconds! It comes with very easy to apply formula that fills up the balding and thinning spots in just a few seconds. Thus, you can also apply it just before heading out for an important event to feel good about your fabulous hair. 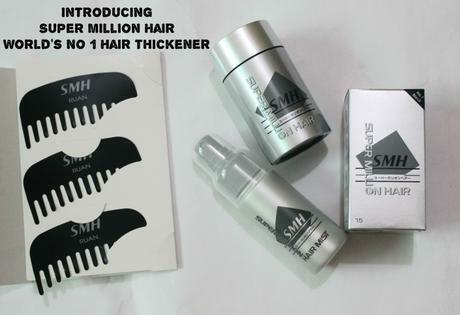 Super Million Hair helps in completely filling in the thinning and balding spots to help you gain the confidence again. Additionally, this Best Hair Building Fibres come in different colors to match your true hair color. This ensures that your hair looks absolutely real, unlike any fake wig. Also, the dense formula of this processed static charged natural hair building fibers is very effective to conceal your hair thinning naturally. The natural fibers (rayon) that are extracted from pulp and cut into tiny pieces of 0.3 to 0.5 mm adds volume helping the hair coverage naturally. Super Million Hair is the best thin hair solution for people with hair thinning or baldness problem. This stays on the scalp adding thickness to your thinning hair and bald area. 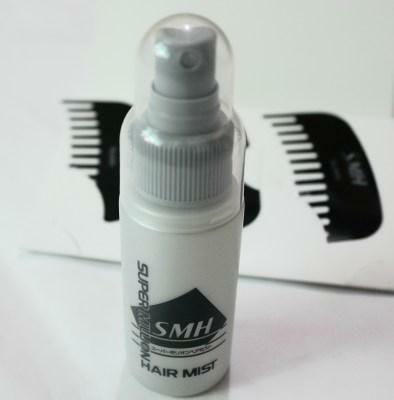 The specially formulated mist works as a bonding agent interlocking the hair fibers placed on the thinning area. Super Million Hair is not a cure for baldness or hair thinning but the best solution to cover your head with hair completely and in an unnoticeable way. This absolutely leaves no visible patches or thinning spots and makes the hair look thicker. You just have to apply this directly to the bothering area to get the desired results. Simple isn’t it! Now you don’t have to invest in any expensive surgeries or wait around to look and feel younger. 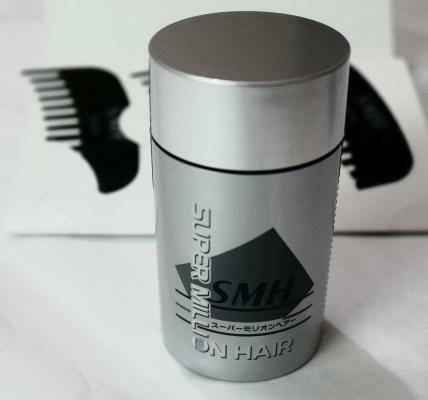 Tap gently the Super Million Hair fibers container over your hair thinning or bald area. Apply this to clean and non-oily hair. Gently Stroke this area using hand to scatter & distribute the fibers well into your hair. Spray Super Million Hair Mist which helps to secure the fibers. Make sure you hold this spray 15cm away from the hair. Time-saving, as there only 2 simple steps that will take just 30 seconds! Super Million Hair fibers attach so seamlessly to the hair with its static charge and help to create a thicker hair look on your head instantly. The amazing formula is undetectable to the human eye. So no more worries about the fake wig look. Super Million Hair – World’s No 1 Hair Thickener & Concealer is durable even in rain, wind or perspiration. You just need a hair wash to take it off. Very affordable for what it does. Price of Super Million Hair (Fibre Container + Mist) is just Rs.2590 for 15gms. Buy it HERE. Also available at Purple, Paytm, Flipkart, and Snapdeal. The formula comes in a container and spray can that makes the application so non-messy and easy to apply. This hair building fibres help in improving your hair appearance by erasing the bald spots & thinning areas. Available in different colors for a natural appearance. It’s a non-toxic product made from natural plant fibres that don’t stain your clothes or rub off. Super Million Hair Fibres help to fill in the hair making you feel awesome. Now, no more hiding your hair in hats for balding spots. Also, forget about those expensive hair plugs or painful hair transplants. 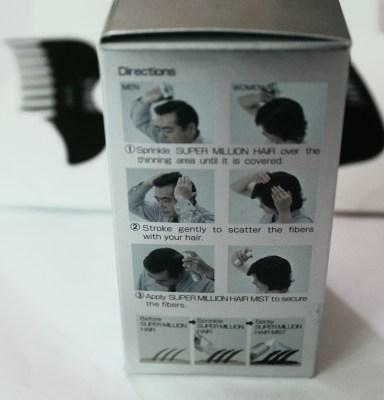 Now, you can fix your thinning hair and balding hair problem within just a few seconds with Super Million Hair. It’s completely easy to use, non-messy and pain-free. Order Super Million Hair Now! 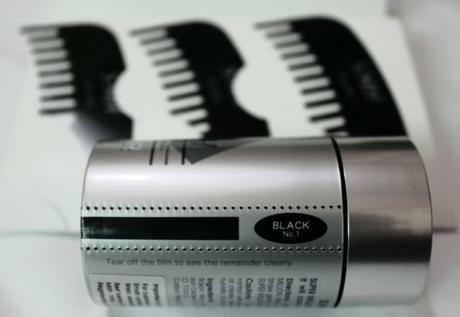 Do let us know your feedback on Super Million Hair: Get Rid of Balding and Thinning Spots in Just 30 Seconds!